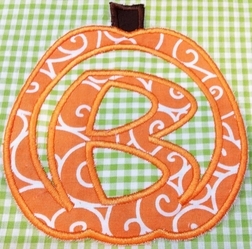 A sweet and different idea for Halloween, Thanksgiving and all throughout the fall season. The outfit is available in a dress or swing top and trousers. 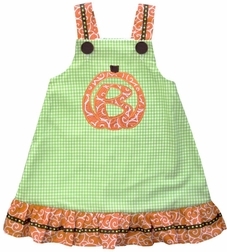 The dress/swing top is made with lime green gingham fabric and has an elegant orange and white scroll fabric ruffle trimmed in brown with silk orange dots ribbon. The trousers if chosen are made just like the dress/top: lime green gingham fabric with a ruffle at the hems.